If you love to command the road, then you will love what the 2018 Mercedes-Benz C-Class performance allows you to do. 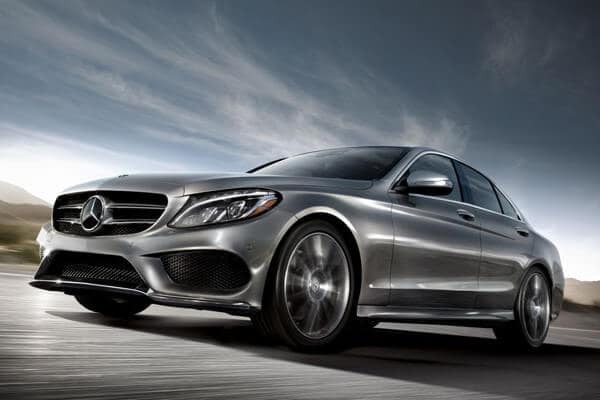 This luxury sedan is available with multiple different powertrains and performance features, but no matter which configuration you drive around Charleston, expect the C-Class sedan to offer speed, strength, and sleek moves. Take a test drive at Mercedes-Benz of Charleston, and contact our team to ask questions or schedule an appointment to tour our inventory. The C-Class comes standard with a turbocharged 2.0L four-cylinder engine that produces 241 hp and 273 lb-ft of torque. You also have your choice of a plug-in hybrid engine or three performance-oriented AMG® engines with up to 503 hp. Every version of the C-Class sedan has an athletic feel on the road thanks to an advanced suspension system that hugs the curves and upgrades the dynamism of the drive. Drivers have the ability to automatically re-tune various performance specs based on how they prefer to drive. This unique feature has separate settings for ECO, Comfort, Sport and Sport+. The C-Class sedans are able to get impressive fuel-efficiency ratings while still feeling powerful thanks to a feature that automatically shuts the engine off at red lights and automatically restarts it once gas is applied. You have the option to equip the C-Class sedan with the 4MATIC® all-wheel drive system. This system detects when any one of the wheels is slipping and then selectively applies additional torque to maintain traction on wet roads or in extreme driving conditions. One of the most exciting upgrades for the 2018 model year is the addition of a nine-speed automatic transmission that offers a supremely smooth and refined driving experience at all times. For even further performance upgrades, you can upgrade to an AMG® model. The only way to know if this model drives how you want it to drive is to get behind the wheel and evaluate it on the road. To further explore performance, compare the Mercedes-Benz C-Class vs. BMW 3 Series. And if you’re still considering your options, take a look at another Mercedes-Benz sedan. But no matter what, rely on Mercedes-Benz of Charleston for any and all of your automotive needs.